Get Top Dollar for Your Saddle and Horse Tack! By Appointment Only – We can sell your saddle and horse tack as quickly as possible for the best price. Best of all, you won’t have to deal with broken appointments and strangers coming to your home – the hassles of selling yourself! Saddle Up Tack is the premier saddle and horse tack consignment store in San Diego. Unlike other tack stores which have just a small area in the back of their store for consignment items, our store has dedicated over 1300 square feet just for consignment. Our prime location is right in the middle of Poway horse country, just a short drive from Ramona. Besides the walk-in exposure your tack will receive in our store, we also have some of the most aggressive advertising on the internet through major search engines and targeted high-traffic sites, providing maximum exposure for your quality saddles and tack, boots, and riding gear and show clothes. We allow your potential buyers to pay with both cash, checks and credit cards. The ability to accept credit card payments means more money in your pocket when sold, especially for higher priced items such as Saddles. 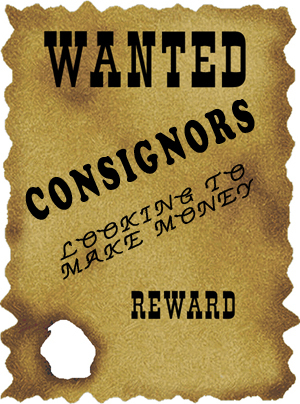 Consignment items are professionally presented and aggressively marketed to sell quickly and for the best retail value. Remember, we don’t get paid unless your items sells! When selling yourself you have to advertise your items and make appointments with potential buyers. Advertising can be expensive and there is no guarantee the customer will show up for schedules appointments. Even if they do, you have no way of pre-screening potential buyers and you are forced to invite total strangers to your home. This is a potential safety risk for you and your family. When consigning with Saddle Up Tack, we advertise your items and deal with all potential customers. Often sellers find themselves being stuck with bad checks, but this is not an issue when we sell your tack. Consigning your tack with Saddle Up Tack will give you peace of mind. You won’t have to deal with annoying late-night phone calls or waste your time showing your items to browsers, not buyers. way to put the most amount of money in your pocket. Take advantage of all these benefits – consign with us today!